If you changed your mind and are not entirely satisfied with your purchase, simply return the unused item with us before our next monthly buying trip. 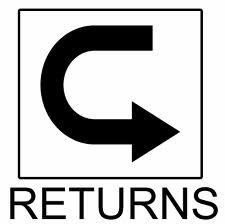 Contact MyBoxBuyer by email to arrange a drop off of your IKEA return. A receipt and the item’s original packaging are required for all returns and exchanges. Refunds will be issued as cash transfers following a regular scheduled buying trip. Please note that we do not accept returns on used bedding (i.e., all bed linens, duvets, pillows and pillow-tops), any mattress or stuffed/ upholstered product without a law label, cut fabrics, made-tomeasure items (i.e., custom countertops), any product that has been modified/altered/washed, AS-IS products and IKEA gift cards. A flat rate of $50 applies for all return services for MyBoxBuyer clients.